17% larger than the standard model. Big Guys cuffs are ideal for restraining larger subjects who have trouble placing their hands behind their back. Available in nickel, 12.7 oz. 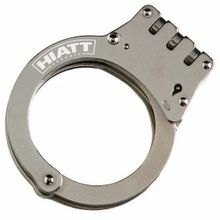 These Hiatt Oversized hinged handcuffs are Hiatt's max rated cuffs. They are 17% larger than their standard model, have 18 locking positions .Oversized Hinge-Steel Oversized hinge style handcuff with solid links which connect the cuffs as opposed to the roller chain. Heavy-duty solid hinges for reinforced holding power. A unique back-loading feature for fast application � open cuff can be snapped back into place with a quick motion of the wrist and then reapplied without having to release the offender�s hand. 18 teeth � 3 independent retaining bars with 6 teeth on each make it extremely difficult to pick, while providing increased strength as the shackle engages the additional teeth. A Leaf Spring instead of a coil spring in the double lock mechanism used to foil a suspect�s attempt to overcome the handcuff�s double lock mechanism. True Swing Technology which ensures the swing arm is balanced and centered so it locks into the center of the shackle every time. Domed rivets which are bigger on the outside than the inside making it very difficult to pop out without drilling.